Political parties have united around a campaign to see a proposed new law allowing the prescription of medicinal cannabis extended to Northern Ireland. Billy Caldwell, 13, from Castlederg, Co Tyrone, who has severe epilepsy, has been battling with the authorities to be prescribed the medication. His mother Charlotte says medicinal cannabis helps to control his seizures. Specialist doctors in the UK will be able to legally prescribe cannabis-derived medicinal products by autumn, Home Secretary Sajid Javid announced earlier this year. But as it is a devolved matter, it will require legislative change before it is enforced in Northern Ireland. Devolved government has been in suspension since January 2017. Mrs Caldwell and Billy are lobbying to ensure the law is extended to Northern Ireland. They met representatives from the DUP, Sinn Fein, UUP, SDLP, Alliance, Green Party and People Before Profit at Stormont on Friday to request their support. The delegation included West Tyrone MP Orfhlaith Begley (Sinn Fein), who has been a long-term supporter of Mrs Caldwell and her son. Speaking after the meeting, Mrs Caldwell detailed their next steps. “A fantastic meeting, we were fully supported by all the parties,” she said. 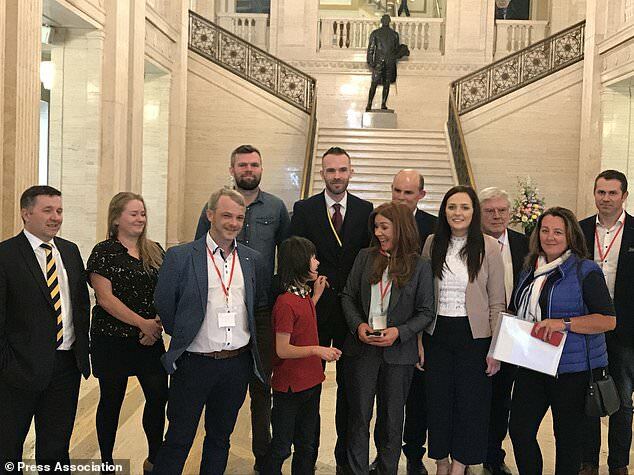 “I feel very proud and blessed today, this support shows that the will is here for this to move forward and Billy’s Law to be implemented in Northern Ireland. Mrs Caldwell and the group are also set to meet health chiefs to attempt to “change the way of thinking in the NHS in Northern Ireland” with regard to medicinal cannabis. They are set to request meetings with Richard Pengelly, the permanent secretary at the Department of Health in Northern Ireland, Chief Medical Officer Dr Michael McBride and Martin Dillon, chief executive of the Belfast Health and Social Care Trust. “A great day, victory for all. The medicinal cannabis legislation will be implemented in Northern Ireland for all the people of our country who desperately need it,” Mrs Caldwell said. Ulster Unionist leader Robin Swann was among the politicians backing the pair. He said it is unfortunate that the Northern Ireland Assembly remains in suspension and cannot act on the matter. “But this is something we are all united on so I don’t want to bring division into it by having a political point scoring exercise,” he said. Earlier this year Mrs Caldwell and Billy travelled to Canada so he could receive treatment with medicinal cannabis. But Billy’s medicines were confiscated when they landed at Heathrow Airport on June 11. They then spent three weeks in London where Billy was treated at the Chelsea and Westminster Hospital. In July, Billy became one of a small number of people in the UK who have been granted a special licence to be treated with medicinal cannabis.